***TXT US @: (419) 362 - 6200*** AWD, Navigation capable (Apple/Android CarPlay), Backup camera, heated seats, blind spot monitors, keyless entry with remote start, automatic headlights, heated/signal mirrors, dual automatic climate control, power windows/locks/mirrors, AM/FM, SiriusXM, auxiliary and USB port, steering wheel mounted audio controls, Bluetooth, power seats with power lumbar, tilt and telescopic steering wheel, cruise control, information center, 17" alloy wheels. Fuel Economy: 25 city / 32 hwy. Warranties: Balance of Nissan's 3 year or 36,000 mile bumper to bumper and 5 year or 60,000 mile powertrain. In service date: 11/21/2017. Extended service contracts available. 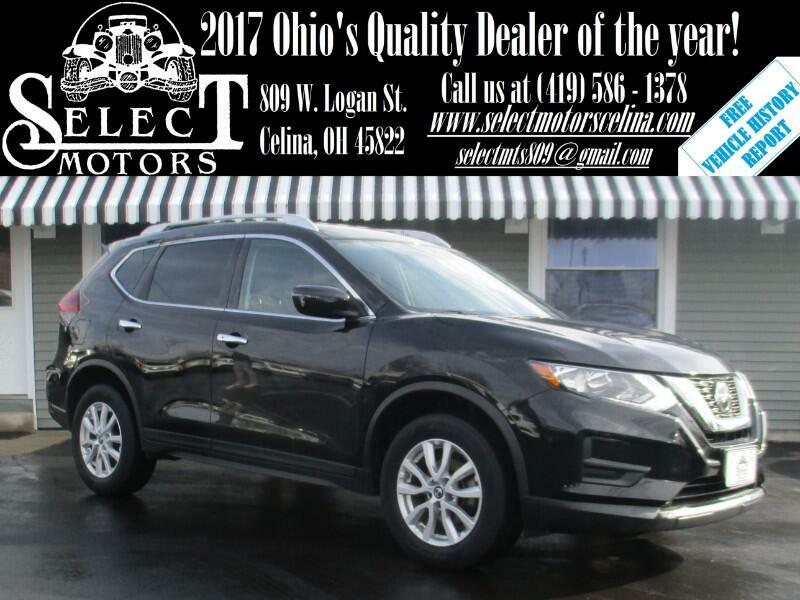 The 2018 Nissan Rogue is a small crossover SUV available in three trim levels: S, SV and SL. The smaller Rogue Sport model is reviewed separately. Most Rogues come standard with a 2.5-liter four-cylinder engine (170 horsepower, 175 pound-feet of torque) paired with a continuously variable automatic transmission (CVT) that sends power to the front wheels. All-wheel drive is available as an option. The Rogue Hybrid is powered by a 2.0-liter four-cylinder engine paired with an electric motor (176 hp combined output) and either front- or all-wheel drive. It's available only in SV and SL trims. Standard features on S trims include 17-inch steel wheels, 40/20/40-split folding rear seats that also slide and recline, a rearview camera, a 7-inch touchscreen display, Bluetooth, Apple CarPlay and Android Auto smartphone integration, and a four-speaker CD player with satellite radio and dual USB inputs. Safety features include blind-spot monitoring, rear cross-traffic alert and automatic emergency braking. The SV trim adds 17-inch alloy wheels, roof rails, a power liftgate, heated side mirrors, keyless entry, push-button ignition, dual-zone automatic climate control, heated front seats, a power-adjustable driver seat, a leather-wrapped steering wheel and a six-speaker audio system. The SV Midnight Edition styling package adds blacked-out body elements such as 17-inch wheels, mirror caps and roof rails. The top-trim SL includes 18-inch wheels, automatic high beams, foglights, leather upholstery, a heated steering wheel, driver-seat memory settings, a surround-view camera system, a navigation system, NissanConnect emergency and convenience services, and a nine-speaker Bose audio system that adds HD radio. Driver assist and safety features include adaptive cruise control, lane departure warning and intervention, and upgraded automatic emergency braking with pedestrian detection. Several of the SL's features are available on the SV as part of the Premium or Sun and Sound Touring packages. Options for the SL include a panoramic sunroof (also available for the SV) and LED headlights, while the Platinum package bundles 19-inch wheels, an electronic parking brake and the ProPilot Assist semi-autonomous driving features. Quilted tan leather upholstery is also available.